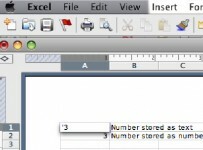 Microsoft Excel offers users a helpful function known as Freeze Panes. Freeze Panes allows users to freeze a row in place so that he/she can scroll through other rows while keeping the frozen ones in place. 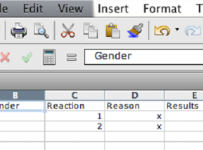 This is an especially helpful function if you have a row that consists of headings, labeling the columns below. 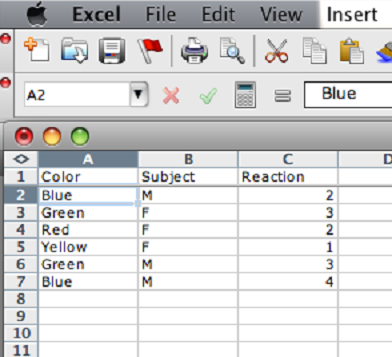 For this example, I have created a spreadsheet with the headings: Color, Subject, and Reaction. Beneath each of these headings that I have created in Row 1 are a list of data pieces. This tutorial will teach you how to scroll through your data while keeping the heading row frozen in place. Before we begin, make sure you are not viewing your Excel file in Page Layout. Freeze Panes will not work in Page Layout view. Use Normal view. From Normal view, select Row 2. You an either select the contents of Row 2, the entire row, or just the first cell, cell A2. It doesn’t make a difference. Once the row is selected, click Window > Freeze Panes. A bar will appear between Row 1 and Row 2. Now, if you try scrolling with your mouse, you will notice that the contents of the three columns scroll through underneath your headings. This is because you froze your row. This feature in Excel makes it easy for you to know at all times what the contents of your columns refer back to as you scroll through your Excel spreadsheet. 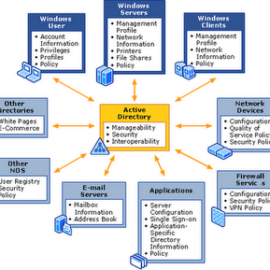 The same principle is applicable to columns as well. The information is very similar, but we’ve gone over it in another tutorial for clarity, as well.